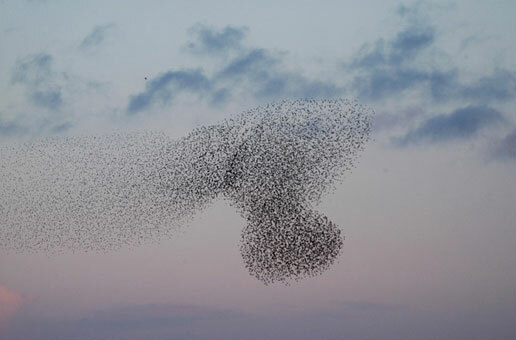 During early spring in Denmark, at approximately one half an hour before sunset, flocks of more than a million European starlings gather from all corners to join in the incredible formations shown in this and following images. The phenomenon is called "Black Sun" and can be witnessed throughout the marshlands of western Denmark, from March through to the middle of April. The starlings migrate from the south and spend the day in the meadows gathering food, sleeping in the reeds during the night. One of the best places to view this amazing aerial dance is in the hamlet of Tøndermarsken, where these pictures were taken on April 5, 2006 from 7:30 to 8:30 p.m..